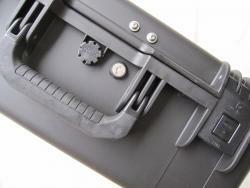 This item includes one 35L Storm iM2600 Case with integrated waterproof Lid Lock. Nearly indestructable and totally waterproof. Great as a DIY top case on a motorcycle, ATV, ORV, RV, Truck, Trailer or any place you need a secure and lockable super tough case.